Short product life cycle, predominantly international supply chain, Fluctuating demand , Environment risk are the key challenges faced by Manufacturing industries today. With many downstream and upstream suppliers located in far away countries, pressure is high on the supply chain to be constantly improving the efficiency. ​Collaboration among the various stakeholders along the value chain is very important. Excel spread sheets and email will not scale up. TPSynergy provides various solutions to ensure supply chain for electronics industry is met at optimum level. TPSynergy control tower gives a bird’s eye view of the supply chain. A high level overview of the supply chain that connects all the parties gives opportunities to identify potential bottlenecks in advance and take corrective actions in advance. Electronic Industry uses contract manufacturing model extensively. This needs good collaboration and visibility in the supply chain to ensure the contract manufacturing is executed perfectly. TPSynergy’s contract manufacturing module helps to work effectively with the contract manufacturers to get the manufacturing co-ordinate efficiently. TPSynergy’s Forecast collaboration enables manufacturing companies to share their short term and long term situation to not only their immediate suppliers but supplier’s supplier and so on. This segregated data view ensures that each tier in the supply chain is aware of the demand to come and able to provide the necessary capacity to meet the demand. Current location of the inventory in-transit is a very important requirement in manufacturing supply chain. Expedition and rerouting of the supply is needed to meet urgent demand from one location while the material is in-transit to another location. 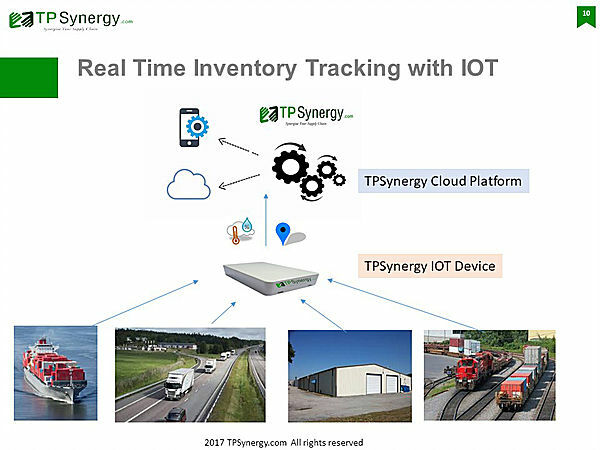 TPSynergy uses Internet of Things (IOT) in supply chain to provide real time location updates of the consignment and enables the supply chain manager to reroute or expedite the inventory as needed. Also any unusual delay while in-transit is detected in advance and corrective actions taken to ensure the inventory reaches its destination on time.